Edmund Jin experienced Guyana in typical Bushmasters fashion – to the extreme! 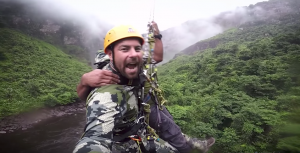 Kayaking 60 kilometers to Kaieteur Falls in uncharted area, then making history by being the first person in the world to rappel down the falls on the largest tension line ever assembled in South America! Edmund continued to survive in the jungle on the acclaimed Bushmasters jungle survival course, left to hunt his food with only primitive supplies. His tough venture is documented in the stunning video below!